Several readers have asked us about Damasteel – what is it? how is it created? who’s using it? and how is it different from Damascus steel? If you’re wondering the same then stick around because we scored an interview with Per Jarbelius and the team at Damasteel – everything is revealed below. Okay let’s get start by explaining what exactly is Damasteel and how this differs from the typical Damascus steel that many of us are familiar with? Damasteel® is a Hot Isostatic Pressed (HIP) Powder Metallurgy (PM) made steel allowing for properties that are typically found in the today’s best performing knife steels. 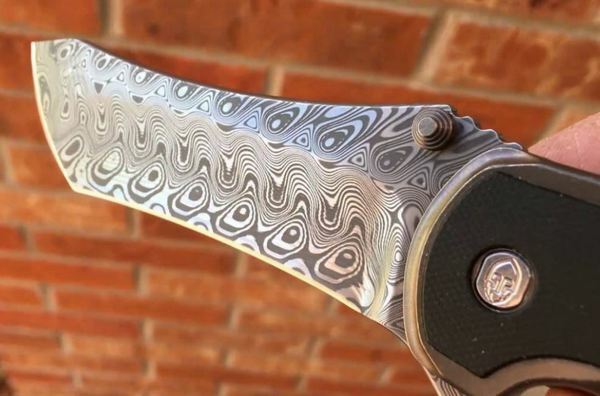 The uniqueness of Damasteel – the patented manufacturing method – is that this is combined with a beautiful traditional made Damascus style pattern. Our blacksmiths starts with the perfect billet, a solid piece of steel. This perfect steel billet has no boundaries and never had any boundaries between the two alloys. Making use of their craftsmanship our blacksmiths then make the unique patterns. 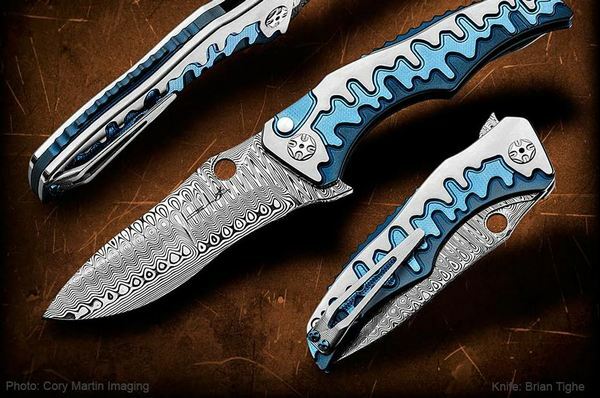 Therefore the Damasteel product meets the beauty of traditional Damascus with the perfection of the modern manufacturing methods with the highest possible cleanliness creating a repetitive stainless patterned steel that can withstand abuse. Tell us about the story of how Damasteel came together and how the company has grown. A researcher – Pelle Billgren – while working at a steel mill in Söderfors, Sweden came up with the idea and process of utilizing the HIP PM process for patterned stainless steel for knife applications together with Kaj Embretsen one of the top knife makers in Sweden. The steel mill is today named Erasteel and is the world largest HIP PM high speed steel maker. Pelle formed the company Damasteel in the late 1990’s. Two years ago the ownership changed from Pelle to Per and Kristina Jarbelius. The company therefore remains a family owned company today employing twelve people. The product is sold all over the world and the US-market is one of the largest. Can you give us an overview of the process of creating Damasteel ? Next there is a cold compaction press to allow for the subsequent HIP at high temperature and high pressure. Out of this will come a solid piece of steel which already has a perfect structure. This can be compared to conventionally made steel which at this point in the steel process as an ingot will have a very coarse structure in need of a break down in subsequent forging or rolling processes to become a good piece of steel. Also the Damasteel product will be forged and rolled into a usable size but the only purpose for the Damasteel product is to achieve a desired size not to improve the structure of the steel because it is already perfect from the start. At this point Damasteel takes the product from the steel mill and our blacksmiths lays their hands on every bar using traditional forging techniques to create the visual effects of the intricate patterns. Every pattern is handmade by our blacksmiths and special care is taken to ensure the highest quality and receptiveness of the pattern. This is a true work of art and the skills of the blacksmiths is reflected in the result. However the steel was perfect from the beginning and as delivered by Damasteel it will remain a perfect metallurgical product. Tell us about the different steel alloys and patterns you are currently producing and which are most popular for knife production. A martensitic, stainless, hardenable and non-patterned steel. The key attribute of the RWL34™ is its suitability to mirror polishing. With the highest level of cleanliness as with all Damasteel® grades it will deliver an incomparable surface finish. Like the Damascus patterned steels it is a rapidly solidified powder steel for highest edge sharpness and toughness. RWL34™ is one of the two steel grades used in DS93X™ martensitic knife steel. RWL34™ comes in bars and sheets. A nitrogen alloyed martensitic stainless steel which represents an outstanding combination of corrosion resistance and edge strength. This combination of properties is the reason for its evolutionary suitability as blade steel. Consists of two non hardenable steel grades in more than one hundred layers. It is stainless and suitable for jewelry, flatware, watchcases and similar products. The most popular steel grades for knife making are the Damasteel DS93X Martensitic Damascus Patterned Steel and Damasteel RWL34 Martensitic Steel. 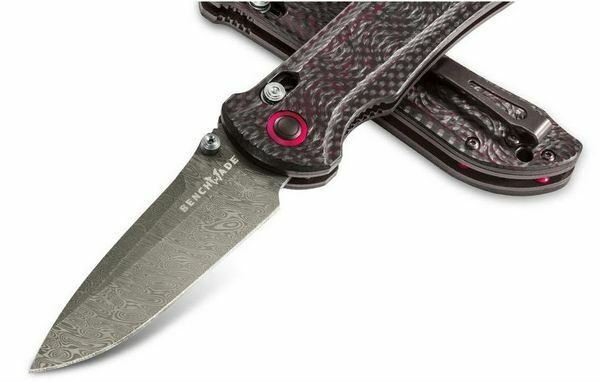 In the Damasteel DS93X we offer a number of patterns that can be viewed on our website www.Damasteel.com – selection is a personal preference. The smaller busier patterns tend to be more popular for small knife blades and the larger more extended patterns for larger knife blades. We have today 16 standard patterns. On top of that we can make custom patterns on demand. What are the main advantages of Damasteel over the competition? Damasteel is the best performing stainless Damascus steel in the world using the latest gas-atomized PM technology with very high cleanliness. It has incomparable toughness and strength combined with excellent edge retention and corrosion resistance. 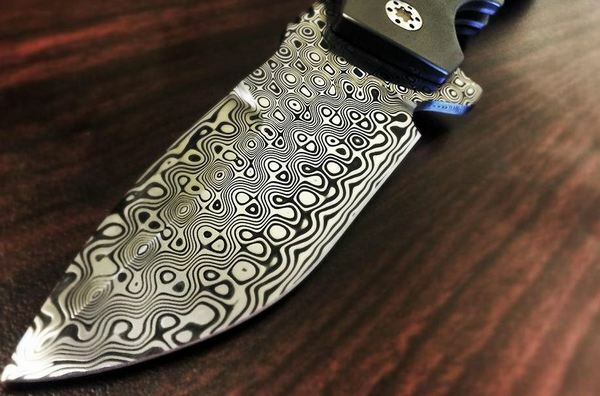 This allows for a very user friendly Damascus steel that is made to be abused. For the manufacturer the highest quality combined with consistent patterns makes Damasteel very easy to work with. A Damasteel martensitic stainless knife blade heat treated to 60 to 62 HRC will be a reliable hunting knife to be used under the most demanding conditions while also displaying the beauty of a Damascus pattern. As an example of its strength the Damasteel product is used in some of the most sophisticated and expensive shot gun barrels made in the world. However the Damasteel product is also used for chef knives, utensils, jewelry, watches and many other areas solely because of its beauty. How would Damasteel compare to a popular knife steel like CPM-S30V? The interweaving of these two alloys in Damasteel provides superior strength and toughness while affording a good edge retention. Compared to a popular knife steel as CPM-S30V that has a higher Carbon and Vanadium content and having a coarser carbide structure Damasteel will have a finer carbide structure that allows for a sharper edge that is easy to maintain. This is of course important for delicate cutting operations such as skinning, butchering and carving meat were its sharp edge together with superior toughness will also minimize the risk of chipping. Which popular knife makers and brands are currently working with Damasteel? Many well-known knife makers in the US and around the globe are using our steel. To mention a few Brian Tighe and Michael Walker has pioneered the use of Damasteel in US and Canada. Today a number of custom oriented US knife makers including Pro-Tech, Grimsmo, Begg Knives, Southard Knives, Lambert Knives and O’Hare Knives all are using Damasteel. Further, Benchmade, Buck, CRKT and Spyderco are examples of US knife brands who carry product lines using Damasteel. Internationally Victorinox and several other top knife makers such as Böker, LionSteel and FoxKnives offer the Damasteel knife blade product. South African Des Horn together with the late Wolf Borger pioneered the use of Damasteel internationally. When it comes to chef knives WMF of Germany is the most widely recognized brand using our steel. Where can knife makers in the US go to obtain Damasteel for their knives? The Damasteel product is offered by several authorized distributors that carry inventory in the US and Canada. The names are listed on our web site www.Damasteel.com In addition Damasteel Sweden carries an extensive inventory to support our distributors. Also Damasteel Inc. located in Dyer, IN supports the Damasteel product with our distributors and end use customers. What can we expect from Damasteel going forward? Any exciting new projects you can tell us about?